Present: Derek Fox, Jerry Ford, Joel Emter, Michael Kreitinger, Terris Dietz, Ryan Jilek, Joe Natwick, Greg Walter, Craig Whippo, Ellery Dykeman, Rocky Stoltz, Casey Ritz, Nate Shilman and Jon Stika. Discussed surplus hops for sale by Laughing Sun Brewery in Bismarck. Greg moved that the club pursue compilation of an order among members and purchase of order by the club. Seconded by Derek. Motion passed. Jon will canvass members to determine variety and amount of hops to be purchased. Discussed hop rhizomes for upcoming growing season. Greg will canvass members to determine if a combined order might be made from Great Lakes Hops. Several members currently grow hops and would be willing to share rhizomes upon request. Jon presented the club with a courtesy copy of “Craft Beer for Homebrewers” that was given to the club by the publisher Quarto Group. A copy of another book by Quarto Group, “Brew Your Own Big Book of Homebrewing” will be forthcoming in April. Jon and Ryan reported that their respective breweries and beers are now on Untappd. 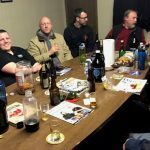 Jon reported that he used some excess Two-Track malt that belonged to the club to brew a batch of Oktoberfest that will be packaged in one of the club kegs. Jon reported that he had updated the “Local Water” page on the club website. The page describes the water chemistry of Dickinson municipal water, ions important to homebrewers and how to treat the water to improve it for use in brewing beer. Jon reported that he authored the article “How to Cold Steep, a Cool Approach to Specialty Grains” in the March-April 2017 issue of Brew Your Own. 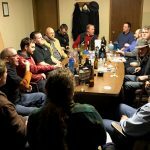 You are currently browsing the Heart River Homebrewers weblog archives for February, 2017.